This Committee is made up of the chairpersons of the ministries indicated below, along with other concerned parishioners who gather as needed to discuss, evaluate and form our community’s worship experience. This Committee is concerned with fostering worship that will glorify God and help to bring the assembly into His mysteries through sign, symbol and song. Parishioners interested in joining a choir are to contact the Pastoral Musician. The ability to read music is not necessary. However, some basic musicianship skills are required. The love of music, the discipline to learn and a strong faith commitment are basic to music ministry. Cantors . . . lead the congregation in song. The principal role of the cantor is to lead and proclaim the Responsorial Psalm following the First Reading and lead sung prayer. Those with a good voice and a sense of leadership are encouraged to cantor. Mixed Choir . . . rehearses on Thursday evenings at 6:30 p.m., from September through the beginning of June, and typically sings at the 10:30 a.m. Mass. The Alleluia Ringers Handbell Choir . . . rehearses regularly and plays at regularly scheduled liturgies and feast days. Instrumentalists and Accompanists . . . persons who have musical talent with an instrument are asked to assist with the accompanying of the assembly. This sharing of talent can significantly enhance many of the major celebrations. All instrumentalists are under the direction of the Pastoral Musician. This ministry calls forth parishioners who have a strong sense of commitment to proclaim the Word of the Lord at parish liturgies. Workshops and resource books are available to facilitate readers in their ministry. These Extraordinary Ministers assist the priest celebrant with the distribution of the Body and Blood of Christ at Mass. Training is provided using the Archdiocesan guidelines as well as guidelines set forth by the U. S. Conference of Catholic Bishops. Young men and women from grade five through high school are encouraged to participate in this ministry. Servers are scheduled for Sunday liturgies (8:00 & 10:30 a.m.) and feast days. 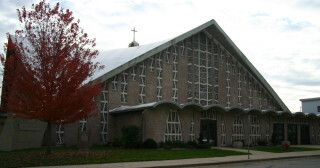 Adults of the parish are encouraged to assist as servers for Saturday 4:30 p.m. Mass and funeral liturgies. Training is provided. Contact the Parish Office to volunteer. This ministry includes the ministry of Usher and Greeter. These ministries provide a welcoming and hospitable atmosphere for worship. All are encouraged to be a part of this ministry. People with creativity are invited to help create a worshiping environment which assists all to experience the Lord through symbol and beauty. All art forms are welcomed. The Pastoral Musician coordinates the art and environment ministry. This is a group of volunteers who care for the sacristy and church sanctuary. Their presence is felt in the clean, polished and welcoming environment of the church. Ministers are scheduled as groups. Volunteer to bring up the bread and wine at liturgies.